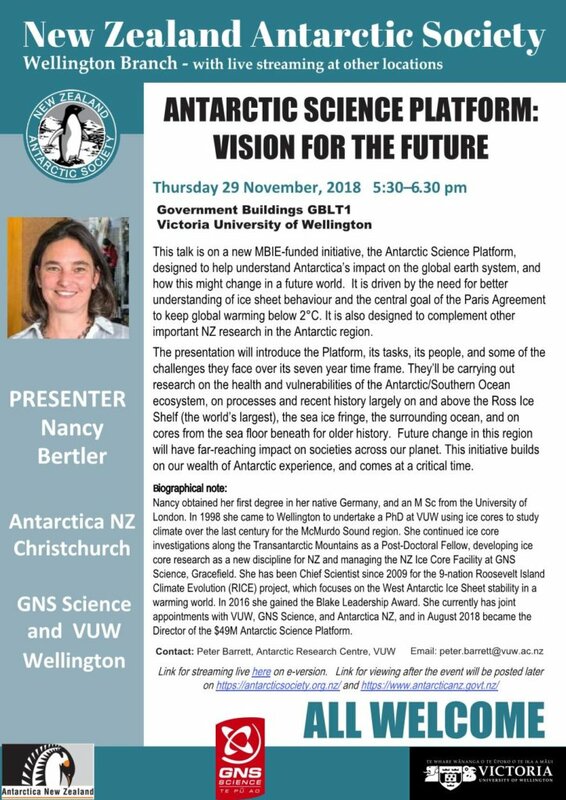 This talk is on a new MBIE-funded initiative, the Antarctic Science Platform, designed to help understand Antarctica’s impact on the global earth system, and how this might change in a future world. It is driven by the need for better understanding of ice sheet behaviour and the central goal of the Paris Agreement to keep global warming below 2°C. It is also designed to complement other important NZ research in the Antarctic region. The presentation will introduce the Platform, its tasks, its people, and some of the challenges they face over its seven year time frame. They’ll be carrying out research on the health and vulnerabilities of the Antarctic/Southern Ocean ecosystem, on processes and recent history largely on and above the Ross Ice Shelf (the world’s largest), the sea ice fringe, the surrounding ocean, and on cores from the sea floor beneath for older history. Future change in this region will have far-reaching impact on societies across our planet. This initiative builds on our wealth of Antarctic experience, and comes at a critical time. Nancy obtained her first degree in her native Germany, and an MSc from the University of London. In 1998 she came to Wellington to undertake a PhD at VUW using ice cores to study climate over the last century for the McMurdo Sound region. She continued ice core investigations along the Transantarctic Mountains as a Post-Doctoral Fellow, developing ice core research as a new discipline for NZ and managing the NZ Ice Core Facility at GNS Science, Gracefield. She has been Chief Scientist since 2009 for the 9-nation Roosevelt Island Climate Evolution (RICE) project, which focuses on the West Antarctic Ice Sheet stability in a warming world. In 2016 she gained the Blake Leadership Award. She currently has joint appointments with VUW, GNS Science, and Antarctica NZ, and in August 2018 became the Director of the $49M Antarctic Science Platform. For the first time, the presentation will also be live-streamed HERE.